Orlando Pulse shooting timeline: How the worst mass shooting in U.S. history unfolded. Police stand near the area of the mass shooting at the Pulse nightclub in Orlando, Florida, on Sunday. Fifty people were killed and another 53 wounded early Sunday when a gunman opened fire in a crowded LGBTQ nightclub in Orlando, Florida, according to officials. The shooter has been identified by law enforcement as Omar Mateen, an American citizen living in Florida whom the FBI had previously investigated for possible terrorist ties. For the latest, you can follow Slate’s live-blog. Below is our best attempt to construct a timeline of how the shooting unfolded based on statements from local and federal officials, eyewitness accounts, and media reports. It is possible—and perhaps likely—that police will revise their official narrative as they continue their investigation. 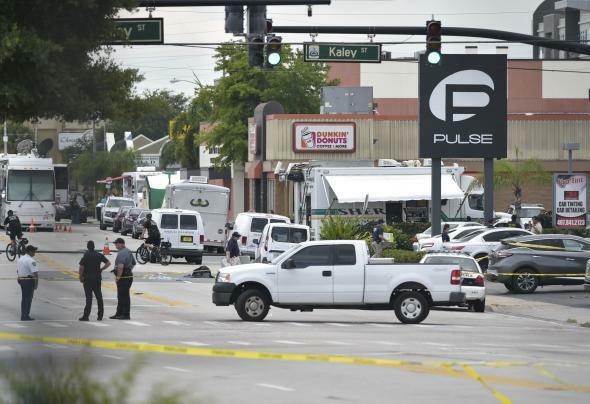 Approximately 2 a.m.: Mateen, carrying a handgun and an AR-15–style semi-automatic assault weapon, opens fire at patrons inside the Pulse nightclub, where an estimated 300 people are inside. Several clubgoers mistake the initial shots as part of the music. Many patrons are able to flee the scene, while others are forced to take cover in the bathrooms and around the club. Approximately 5 a.m.: Police set off two controlled explosions to distract the gunman while they use an armored vehicle to gain entry to the club. (There are conflicting reports as to whether the vehicle smashed down a door or broke through a wall.) Mateen begins shooting at the officers and SWAT members return fire, killing him. According to police, 11 officers in all fire shots at the suspect, and 30 people are ultimately rescued from inside. It remains unclear whether the death toll—which made the massacre the deadliest mass shooting in U.S. history—includes the shooter. It is also unclear whether any of the victims were killed or injured during the roughly three-hour standoff. According to local officials, 39 people were found dead in the club, two bodies were found on the street just outside the venue, and nine others died either at local hospitals or in transit to them. We’ll continue to update this post with more information as it becomes available.